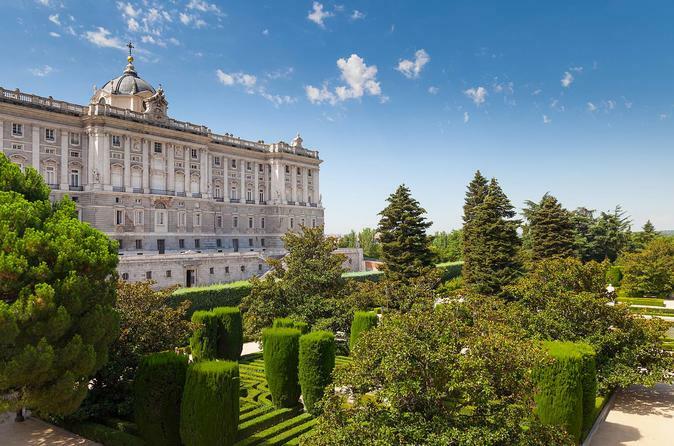 Discover the Royal Palace of Madrid on a 1.5-hour guided walking tour. You will be able to discover how the kings of Spain lived. You will meet your guide at a meeting point. Hotel pickup and drop-off is not included. The Royal Palace proposes a trip to the history of Spain through its several rooms. It is the official residence of the kings of Spain and one of the most fascinating buildings that you can see on your trip to Spain. It has 3000 rooms that are perfectly preserved. The main staircase was designed by Sabatini and has more than 70 steps. In the Royal Palace, you will also get to experience the Throne Room and The Hall of Alabarderos. Though the Royal Palace of Madrid isn't the oldest palace of Spain, it has many interesting stories and legends. In addition, you will also visit the Royal Chapel and the Palace Gardens.